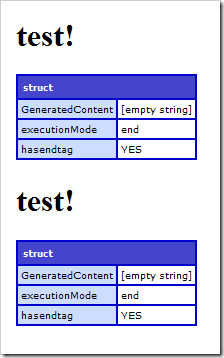 "ExitTemplate" simply stops the current mode of execution, not the entire tag. That said, something still feels "buggy" though because if you exit the template (hault the START mode of execution), you still shouldn't see the output twice - it would only jump to the body (which you don't have) and then on to the END mode execution, which would only show once. Hmmm, I think. Oh sorry, I didn't see the comment you had - right, you are using the correct CFExit method... ok, now I'm back to being stumped. Ok, so if I remove the CFAbort at the end, this starts to work correctly. After the CFAbort, ColdFusion must be confused as to what to do with the remaining buffer content? Perhaps it just dumps it out? . . . . Hello in Tag! This will duplicate the output. Remove the CFContent OR the CFAbort and it works fine. Have them both, and you definitely get some sort of bug. That's the point of the bug. For my actual code, the end execution is required. This is just a simplified example to show off the issue. The point is it should work, but doesn't. I'm having the same problem currently. I had a query that I moved into a custom tag. Now I get duplicate results for some odd reason. I wanted to see if the code was being ran twice, it's not. Just outputted twice for no apparent reason. I am not using the cfcontent or cfabort tags within my custom tag either. BTW I was using a cfmodule call to invoke my custom tag and my problem ended up having the same solution as listed above in the listed "work around." I removed the trailing slash in the cfmodule tag and the code now only appears once. Glad I found this post. Saved me some time and headache. Thanks! Removing the trailing slash worked for me too (CF8). Thank you!! If anyone comes across this post and is still looking for a solution, I was able to get this to work by passing a variable to cfcontent.